Among the ICAA’s most impactful and enduring education models is its Intensive Program in Classical Architecture – an eight-day course of study that introduces participants to the ICAA’s core curriculum through coursework in the classical orders, composition, proportion, drafting, observational drawing, and the literature of classical architecture. Participants learn how to draw, render, and compose with the classical language to form an understanding of the basic theoretical tenets on which the classical tradition is founded. Instruction is provided by professionals and educators active in the field of classical design. Classroom hours are balanced between studio work, lectures, and guided tours and visits. The Intensive program also satisfies the core course requirements for the ICAA’s Certificate in Classical Architecture. You can read more about last year's Intensive program here. Participants learn how to draw, identify, render, and compose with the classical elements to form an understanding of the basic tenets on which the classical tradition is founded. Topics include: The classical elements and composition, proportion, architectural representation through drawing and rendering, the study of precedent, and the literature of classical architecture. The week culminates in a studio project in which students use the classical canon in the design of a small building. Students are guided through a design process rooted in the Beaux-Arts system in which an initial parti is developed during an esquisse and a charrette into a finished design proposal. The program concludes with a review by an esteemed panel of architects. 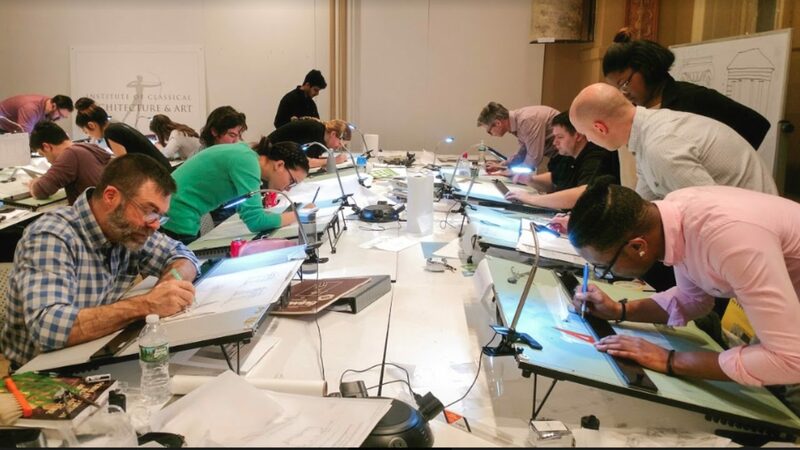 In addition to the reduced student rate above, The ICAA offers a limited amount of scholarships for students and emerging professional for the Intensive in Classical Architecture. Each scholarship is merit based and is assessed on a case-by case-basis. In addition to these, the ICAA also offers The Mark Ferguson Award, The Hampton University Scholarship, and The William H. Harrison Scholarship. Please email [email protected] or call 212-730-9646 x112 with questions. You may refer to the ICAA's cancellation policy here. How many participants do you accept? We accept a maximum of 20 students. Am I required to purchase my own materials? Yes, a materials list will be provided a month in advance of the program. Will there be any time to explore New York City when class is in session? There will be very little time to explore New York City while the Intensive is in session. If you would like to explore New York City, it might be advisable to arrive a day or two prior to the start of the program or stay on after the program ends. Would I be able to sign up to attend only part of the program at a reduced rate? No. Programs are designed to introduce a broad range of skills and experiences which is only possible through full participation.